Good day to you all! 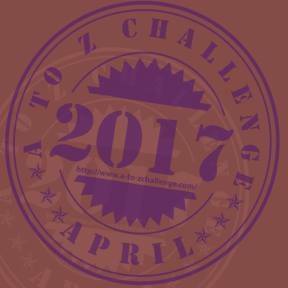 Today, I'll talk about my April A to Z this year and how I think it went. Again, I would like to thank the whole A to Z team for making it possible. Being part of the April A to Z in the last three years has brought me a lot of followers, pageviews and connections. It's helped me push my blog to its limits. This year, howver, I've not had to time to get the most from it and I will explain below. This is nothing to do with the team, but rather to do with me and my circumstances. As has been the case with the last two Aprils, I broke my record for blog views this month, going over 16,000. This does not look like a dramatic rise compared to the previous months and it is not over double, like last year's A to Z, but I put this down to adding my name to the list super early and so I did not get an April A to Z rise just in April but also in February and March. I also got a few more followers and saw a few more great blogs that I am now following. I think I peaked with last year's April A to Z and went downhill this year. Last year, I sent all the wonderful participants individual sets of questions well in advance and published tons of posts. This year, I had less time and sent everyone the same list in a big group email. I also spent less time exploring the list of participants, which is a pain because I know that I have missed out in that respect. I also missed a Sunday post, which is only the second time in the last 3 years (the first time was intentionally, as I was going to cut down on my posting, but didn't). So basically, I din't have the time to get the most out of the April A to Z that I could have done and there is a good reason for that. Back in January 2012, I made a post saying that I was going to cut back on my activity on the blog, due to other commitments. I said that I would post less than once a week, but that didn't stick, because I love posting too much and there was loads going on in the world of gamebooks. However, I also had other writing to do, which I listed and it is taking up a huge portion of time too. I also listed my life as a reason for cutting back on posts. I didn't clarify then, but I will now - when I wrote that post, I knew that I had a baby on the way. Since last year, I've been a daddy on top of doing a job and writing. I've managed to keep going, but I'm definitely feeling the strain of too many commitments now, and it is coming across in the blog as before I might have slipped in a little midweek news update if I had a spare few minutes. That sort of thing has not happened at all this year. I also gave up on the idea of writing a review for all 22 Windhammer entries last year, but maybe this year, with its extended time period, I might have a shot. However, I will still commit to doing a post a week. I tend to bulk write them when I have some spare time, so I can manage that. These post will be more about analysis and less timely. 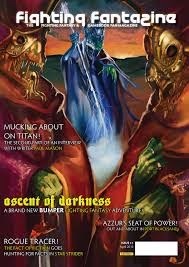 However, I'm still scouring the web for news - it will just go into Fighting Fantazine. I will still like to do next year's April A to Z, but in what form, I don't know. I would like to interview gamebookers, with the aim of giving them more exposure, but that does require a lot of work in March. I could spend the whole year before planning posts or mini gamebooks for the competition, instead, but that will be less current. I think the situation that will arise will be in the middle, where I will get some interviewees and then supplement the posts with mini gamebooks. So there we go. My life is very different compared to August 2010 when I wrote my first, short post about my Windhammer writing. I think this blog peaked in 2012 when I really got into it, but I will still be here bringing some regular posts. Congrats on the April A to Z. Congrats on the blog as a whole, in fact - it's brought a few excellent gamebooks / apps / publishers / authors / developers to my attention that might have gone under the radar, otherwise. I think I'm in a similar situation, it terms of juggling a regular job, writing work, and a baby (I gather my own baby is around the same age as yours). Personally, I manage to blog only every five or six weeks, which is lamentable. Also, I get up at 5:00am more often than I would like, just to spend a couple of uninterrupted hours in front of my computer. April A to Z - bonus interview.